It’s hard to imagine anyone — child or adult — resisting the temptation to dig into a plate of turkey with all the trimmings: cranberry sauce, mashed potatoes, pumpkin pie… But leave it to your toddler or small child to turn Thanksgiving into a nightmare battle of wills thanks to picky eating. A picky eater in your family almost always means you’ll be spending some portion of an otherwise fun day planning different versions of foods he or she will eat or possibly even packing a bag of snacks before you set off for a relative’s house — anything to avoid fighting in front of 50 of your closest family members. The good news is that it doesn’t have to be this way. Your first defense against the picky eater taking over your holiday is to allow him or her to help prepare your Thanksgiving meal — a move that will make children feel more in control of what they’re putting into their bodies. Let’s say you are intent on getting your child to at least try some of the traditional foods served on Thanksgiving — there are ways to work with a picky eater to help make the meal more palatable for them. Johns says picky eaters typically don’t like it when foods are saucy or are mixed together. Avoid unnecessary drama by keeping their plates as uncomplicated as possible. Olivia Munger, registered dietitian at Children’s Health who works with families in their Get Up & Go program, agrees that less is more on Thanksgiving for picky eaters and suggests serving foods with multiple components separately and letting each child assemble their own version of the dish (for example: if string beans are served with almonds on top, scoop the nuts to the side and let your child try them separately). And never underestimate the power of making a meal fun. Another great idea: Start serving unfamiliar Thanksgiving foods at home in the weeks before the meal, Munger says, something that could help them feel more in control when these foods are served on the big day. If you’re traveling for the holiday and feel more comfortable packing foods you know your child will eat, it’s fine to do so — within reason. Just be aware that this can sometimes backfire on parents. “It is important that children learn to be flexible eaters, and catering to their likes and dislikes all the time doesn’t help them grow,” Munger says. 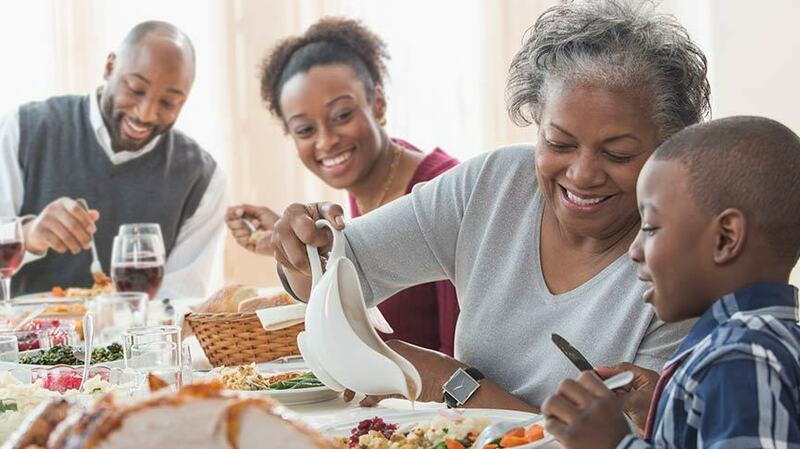 If your older child is a picky eater, Johns says she suggests the same approach, but with a bit of advanced conversation about expectations — eat the turkey first, then they can have whatever food you brought.